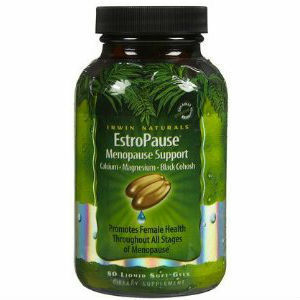 EstroPause Menopause Support by Irwin Naturals is a natural supplement dedicated to aging women and created by a California based company. A mix of minerals, vitamins and herbal remedies, this supplement is intended to provide additional support to women as they age and they need to combat the side effects of menopause. The packaging is aesthetically pleasing, but, as always, what is inside counts more, so here is the information we found about EstroPause Menopause Support by Irwin Naturals that you may find useful in case you want to make a purchase. What Does EstroPause Menopause Support Contain? By the looks of it, EstroPause Menopause Support by Irwin Naturals contains important herbal extracts for sustaining hormonal balance in aging women. Also, the addition of St. John’s wort extract, for instance, shows that the product is created with women’s needs in mind, since the herbal remedy is efficient in treating symptoms of mild depression that are associated with age. The recommended dosage for this natural supplement is four softgels daily. A bottle containing 80 softgels, or 20 servings, costs 23.99USD. We did not see any clear guarantee being offered on the manufacturer’s website. In case you experience any issues with your purchase, you will have to contact them directly. EstroPause Menopause Support by Irwin Naturals is rich in ingredients that are known to treat menopause symptoms, such as black cohosh, but it also contains compounds that are useful for combating the effects of aging. This supplement offers a more holistic approach to treating the side effects women experience as they age and reach menopause. However, a more targeted approach would have been better, in our opinion. Jackie Horowitz	reviewed EstroPause	on April 23rd	 and gave it a rating of 2.